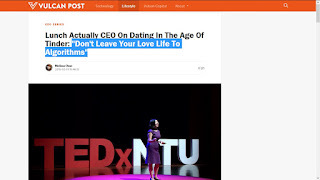 "Breaking the online dating sound barrier": about article: "Don't Leave Your Love Life To Algorithms"
about article: "Don't Leave Your Love Life To Algorithms"
about article "Algorithms We Love By"
No peak for Valentine's day 2019? A new dating app mashes up HQ Trivia with Tinder? when does Facebook's dating app become available?